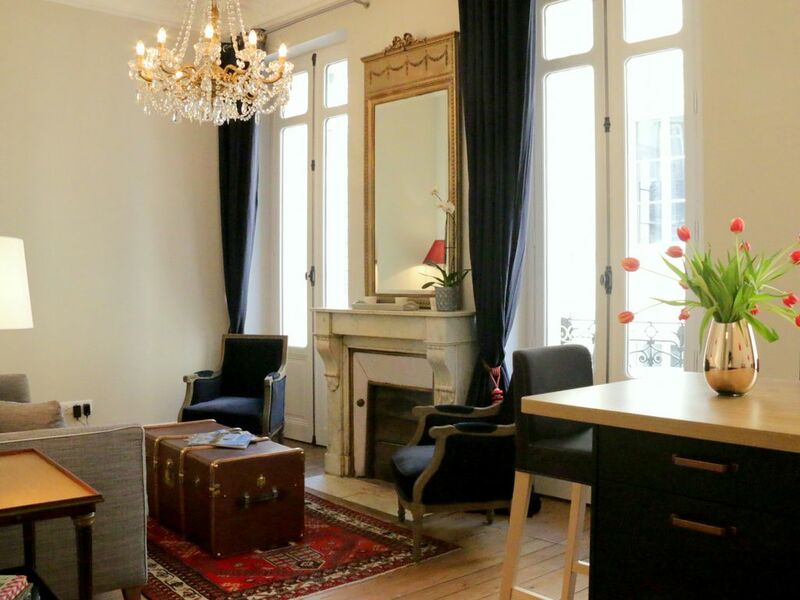 Bordeaux Sainte-André is a charming, light-filled apartment located in a quiet street, just across from Bordeaux Cathedral where Eleanor of Aquitaine was married in the 12th century. It is 45 square metres, with a 4 square metre balcony, and has recently been renovated to a very high standard. As well as an induction stove top, oven, microwave and dishwasher, there is also a washing machine. There is free Wifi and Cable TV. This is a classic apartment, renovated with contemporary comfort in mind. It is on the first floor, up a short flight of stairs. The lounge room looks out onto the eighteenth century streetscape, and Bordeaux Cathedral can be seen to the right. The full length windows are double-glazed, and the ceiling and walls have been insulated, so inside it is whisper quiet. Free Wifi and Cable TV is available. The kitchen is well equipped with an induction stove top, oven, microwave, and dishwasher. There is also a washing machine. Cooking equipment and plates are provided, and kitchen essentials such as oil, vinegar and salt. The toilet is near the entrance, so can easily be accessed by either visitors or guests. The bedroom is at the rear of the apartment and there is an adjoining shower room. Soap, shampoo and conditioner are provided. Bordeaux Sainte-André apartment is located next to Place Pey Berland, and nearby are dozens of cafés and restaurants, a bakery, supermarket and a multitude of boutique shops. The pedestrian shopping streets Rue des Trois-Conils and Rue Sainte-Catherine are a short walk away. In the district you will find several excellent museums, including the Musée d'Aquitaine, which tells the story of Bordeaux and the surrounding region, the Museum of Decorative Arts and the Museum of Fine Arts (Musée des Beaux-Arts), which has a wonderful collection of paintings by French and Dutch masters. Other significant tourist sites of Bordeaux are within easy access. I am a writer, renovator and frequent traveller, and have a particular love for French food, wine, architecture and culture. Originally from New Zealand and Australia, I have worked as a photographer; journalist and the Arts Editor of a large Australian newspaper. My passion is to find older, character properties and to give them a new lease of life. My first property in France was Bordeaux Terrace in 2007. Since then, other owners have asked me to manage their properties and I have taken on a select few. My family and I now live between France and Morocco, and it is a joy to spend part of each year in Bordeaux. The city and region has a huge amount to offer, and it is a pleasure to be able to share this experience with others and help them make the most of their holiday. I work with a trusted team, including English and French speaking property managers. They have a great deal of experience in meeting, greeting and making guests feel comfortable. We are happy to assist in every way. Bordeaux Saint André is one of my most popular properties. It has been renovated to a high standard, and is ideally located in a quiet street, with an extraordinarily close view of the iconic Bordeaux Cathedral, where Eleanor of Aquitaine was married. It's very close to Rue Saint Catherine, and the cafes and charming boutique stores of Rue des Trois Conils. A tram stop just a few metres from the apartment carries you wherever else you would like to go. It's unusually to find such a well equipped, quality apartment that is so central and yet quiet. The view of Bordeaux Cathedral from the balcony is magic. toilet, Outside the bedroom door, so guests can also use it. Fabulous apartment in the heart of Bordeaux! Wonderful stay in fully furnished apartment- every detail has been thoughtfullly considered. We loved the space, the lighting, the coziness and newness of all the furnishings. Simply delightful! We thoroughly enjoyed our stay. The unit was exceptionaly clean and well furnished. Great location! We would not hesitate to return. Very comfortable. It has a traditional feel but all furnishings, appliances and amenties have been updated. Exceptional! This was a beautiful Centre Ville apartment. Easy to walk to almost everything but two tram stops are around the corner. The apartment is on the small side but beautifully rehabbed and every inch of space is utilized efficiently. Lots of thoughtful touches including a well - stocked pantry. Bed is comfortable. Nice shower. Seamless wifi. We'd happily stay here again and can heartily recommend this place to others. Beautiful flat and great location! Did not want to leave after 3 weeks. Will be coming back! Thanks to Trish Tyler for a wonderful stay! Thanks so much for your great feedback. Trish and I are really pleased that you enjoyed your stay at Bordeaux Saint André apartment so much. We'd love to welcome you again! Modern, well appointed and cozy apartment. Trish and her sons were very welcoming and helpful throughout our stay. Highly recommend! Beautiful apartment in a perfect location. For people flying in or out of Bordeaux, you can take the bus line 1 + that stops by the Palais de Justice, especially when flying out of Bordeaux-Merignac airport, it only costs what a regular bus ticket costs, much cheaper than a taxi.